Historically, the Belize District (a prime area) was a group of riverside estates established by its first European settlers. Belize River, which runs through the region, served as an important passageway for the log export. As years past the estates were either abandoned or formed larger settlements, some of which became modern-day villages that acquired new names. Belize abounds in mahogany and cedar. These make excellent lumber and are some of the district’s exports. The rest of the region which is densely populated is covered with mangroves, palm trees, and coastal shrubs. There are also savannas and lowlands. Numerous swamps and lagoons significant to tropical birds and exotic animals such as iguanas and howler monkeys are also protected. Marine life is either promoted for tourism purposes or conserved to make biologists happy. The Mayan ruins of Altun Ha, an ancient trade centre that amaze visitors, are also found here. Colonial buildings survive here and there and traditional wooden houses remain, though modern architecture is increasing. The district’s existing population consists largely of Spanish-speaking mestizos and Mexicans. Main economic activities still largely consists of agriculture, fishing, and farming. Ecotourism is concentrated in the larger islands of Caye Caulker and Ambergris Caye, the country’s top tourist sites, where most real estate developments take place. Activities that lure visitors include bird-watching, diving, fishing, and snorkelling. 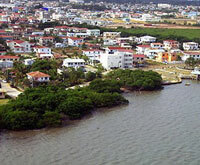 Residential tourism is also fast growing particularly in Belize City, once the country’s capital, and the quiet riverside town of Burrell Boom. Private retirement communities have already been established and continue to attract new members. Ambergris Caye’s close proximity to the Belize Barrier Reef, which was declared a UNESCO World Heritage Site in 1996, is the main reason for its success in the tourism business. 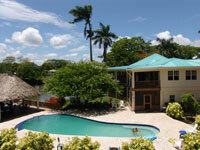 It is simply the most convenient entry point and place to stay for scuba divers and tourists. The diving sites surrounding the island have been designated according to what marine life abounds in them. The Great Blue Hole and Hol Chan Marine Reserve are well explored and highly desired spots. While diving shops and resorts offer diving packages, some local fishermen trade their nets for snorkels and work as guides to supplement their income. The number of visitors the island receives yearly is also a big factor why real estate developments keep increasing here. Hotels, condominiums, and private villas continue to rise. Ideally, the large concentration of modern infrastructure in the town of San Pedro should mean that the rest of the island’s wildlife and natural landscape would be preserved. So far, coconut palm trees and mangroves are allowed to protect lagoons and numerous bird species that nest and rest here, and coastal vegetation is left lush to keep sand intact along the western shores. If a hurricane comes from this side, there should be less damage on the island, theoretically. If there’s a new resident’s wish for a natural disaster, it is the annihilation of pesky bugs and mosquitoes. Ambergris Caye has a number of resorts scattered even outside of the main town. Land properties are also divided and sold. San Pedro is the main town on Ambergris Caye. It has a large Mexican population. As is common with other fishing villages in Belize, the town now heavily relies on tourism for its income. Accommodations range from guest houses to small hotels and cabana resorts lining the coasts. The community is still growing in size as more immigrants move here hoping to get better work opportunities. More guesthouses and resorts are being built. Despite all these developments, San Pedro is still a tra ditional village. Small, brightly painted homes line its cobblestone streets. Clotheslines exhibit the day’s laundry. Neighbours chat with neighbours if they are not vending local goods or assisting tourists. Cayo Espanto is an exclusive island resort consisting of one bungalow called Casa Ventanas and six beachfront villas: Casa Aurora, Casa Brisa, Casa Estrella, Casa Manana, and Casa Olitas. The villas’ architecture and design ingeniously incorporate outdoor with indoor elements that create a sense of oneness with nature. This includes shutters and walls that, once folded, open up the rooms to the garden. Each villa has its own private swimming pool and a line of hammocks. The bungalow stands over the water and has its own dock. Each property is furnished with the best in home entertainment technology, including flat screen television sets and surround sound systems. As mosquitoes are unavoidable, mosquito netting is a necessary feature of bedroom designs. Sand fleas and sea lice are also common, so residents or visitors go to another beach to swim or snorkel. The island is best for idle indulgence or kayaking. Stripped of its status as the country’s capital after Hurricane Hattie devastated it in 1961, Belize City has a way of making people either love or loathe it. The older generations who witnessed the transfer of administrative power somehow passed on to the younger ones a legacy of stubbornness, nostalgia, and aggression. Residents didn’t want to leave their homes and businesses so the government left them behind, together with the city’s colonial architecture that withstood time and reminds one of its historic significance. Central America’s oldest Anglican Church, St. John’s Cathedral, was built here in 1812 and still stands. The white Government House built two years later is now an important museum. The historic Fort George Area has a mix of old homes and newer hotels. Its most famous landmark is the Baron Bliss Lighthouse overlooking the harbour. It was named after its donor, who is buried in a tomb near its base and who was one of the country’s great benefactors. The lighthouse stands proud but is a mute observer of daily city crimes involving thefts and drug dealing. 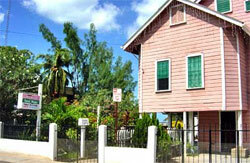 Belize City remains the country’s trade centre. But parts of the town have been neglected. Dilapidated buildings sadden streets. What would lure one to live here is the considerable number of residential houses available for single family occupancy. The town has the convenience of well-stocked shops, schools, medical facilities, and the international airport. Caye Caulker owes its slower development to its lack of good beaches. While cabana-style guesthouses abound, the village council allows mangroves and coastal vegetation thrive to prevent erosion. Part of the island is also a marine reserve site. Mosquitoes and sand fleas are seasonal. There has been a boom in real estate property sales in Caye Caulker as prices are considerably lower than those offered in Ambergris Caye. St. George’s Caye reeks of local and foreign wealth splurged on peace and exclusivity. The island has more private homes and holiday getaways than hotels and resorts, which cater to the rich and privileged. A British army centre, while not intended to protect residents, extends assistance to those who may need it. Its presence is enough to scare off crimes or discourage even accidental misdemeanours. The island is actually generally quiet as there seems to be more buildings here than there are people. No actual roads are built. There is no airstrip and access to the island is solely by boats. There is not much to do either, unless one perpetually enjoys beach-strolling, diving or going on fishing trips aboard nice boats. It is no wonder no one chooses to stay here all year round. Yet its picturesque concrete structures amidst natural coastal vegetations are enough to lure one to invest here. Electricity is not centralized on St. George’s Caye. Homeowners have the option to use generators as electric power is very expensive in Belize. Also, bringing construction materials to the island can be a major concern as all items need to pass through Belize City, the country’s trade centre. More than 200 atolls thickly vegetated with mangroves and coconut palm trees comprise the Turneffe Islands. Its lagoons are significant habitats for ospreys and manatees. Its coral reef systems and diverse marine life make it one of the most explored dive sites in the world. There are also areas designated for fly-fishing, which guarantee what anglers call the “Grand Slam” or a single day catch of pompano, bonefish, and tarpon. The Turneffe Islands receive visiting researchers from different North American institutes, and scientific studies include monitoring of vegetation and the listing of nesting and breeding sites. Environmentalists are rallying for more reserve sites on the islands, but since the islands’ touristic value has risen quite rapidly in recent years, the government has started selling lands to international developers. The Turneffe Island Resort and the Turneffe Island Lodge now regularly accommodate scuba divers. Some atolls have also been divided into several beachfront properties. As more developers win and environmentalists lose, even the small reserves sites are likely to be turned into pieces of real estate. Developers try to appear ecologically responsible by encouraging potential investors to build “eco-conscious” hotels, condominiums, lodges, private homes, and marinas. Burrell Boom was established as a mahogany logging centre in the 1700s as the important Belize River passes through it. The river jungle was the habitat of several bird species, howler monkeys, and crocodiles. Banana plantations thrived in the surrounding area. The local riverside community still relies heavily on the river for food, transport, and water for washing clothes or irrigation for small-scale farming. Agriculture is the main economic activity. Burrell Boom’s fertile lands still produce bananas and grow apples, berries, and mangoes. Homemade jams and wines are a local pride. The community also tries to help nature by protecting howler monkeys in the Community Baboon Sanctuary. Despite seriousness in business, the people also know how to take a break as the village hosts a popular canoe race called La Ruta Maya. Burrell Boom’s peacefulness and friendly neighbourhood has caught the attention of developers who now promote it as an ideal retirement community. Riverside lots were cleared to make way for the construction of small resorts and private residences. Acres of lands intended for farm use or cattle breeding are also available. Just recently a reservoir was rebuilt to service the entire village, though water wells are still in use.